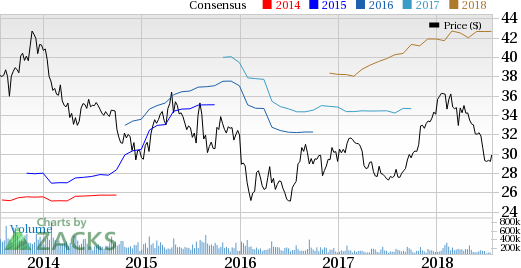 Honda (HMC) to Report Q1 Earnings: What’s in the Cards? Honda Motor Co., Ltd. HMC is expected to report first-quarter fiscal 2019 (ended June 2018) results on Jul 31. Last reported quarter, the company delivered a positive surprise of 21.7%. In fact, Honda surpassed expectations in each of the trailing four quarters with an average beat of 41.2%. Honda has an expected long-term growth rate of 3%. In the past three months, shares of Honda have underperformed the industry it belongs to. While the stock has lost 14.1%, the industry has declined 6.5%. Per Honda’s Electrification Initiative, the company aims at achieving two-third of its global auto sales consisting of electrified vehicles by 2030. In sync with this goal, it already started manufacturing its all-new 2019 Honda Insight hybrid at its Greensburg, IN facility in May. Further, the company announced a $29-million investment in the Honda Transmission Manufacturing of America plant at Logan County’s Russells Point for the production of Insight’s twin electric-motor unit, which is integral to the vehicle’s powertrain. In June, with intent to develop more affordable commercial solution for fuel cell and hydrogen storage systems, Honda partnered with General Motors Company. Under the terms of the agreement, both companies will work together to develop batteries for electric vehicles (EVs), majorly for the North American market. The collaboration will aid Honda to offer energy storage systems while simultaneously saving development costs to a great extent. However, despite undertaking such cost-controlling initiatives, Honda is witnessing elevated expenses, which are weighing on its profit margin. Further, frequent vehicle recalls over the past few years are not only increasing expenses but are also hurting customers’ confidence in the company. Our proven model does not conclusively show that Honda is likely to beat on earnings this reporting cycle. This is because a stock needs to have both a positive Earnings ESP and a favorable Zacks Rank #1 (Strong Buy), 2 (Buy) or 3 (Hold) for this to happen. But that is not the case here as you will see below. Earnings ESP: Honda has an Earnings ESP of 0.00% as both the Most Accurate Estimate and the Zacks Consensus Estimate are pegged at 99 cents. You can uncover the best stocks to buy or sell before they’re reported with our Earnings ESP Filter. Zacks Rank: Honda currently carries a Zacks Rank #5 (Strong Sell), which lowers the predictive power of ESP. So, we caution against Sell-rated stocks (4 or 5) going into the earnings announcement, especially, when the company is witnessing negative estimate revisions. Moreover, the company’s 0.00% ESP makes surprise prediction difficult. Therefore, this combination decreases the odds of an earnings surprise. Oshkosh Corporation OSK has an Earnings ESP of +2.90% and a Zacks Rank #2. Its third-quarter fiscal 2018 results are scheduled to be released on Jul 31. Cummins Inc. CMI has an Earnings ESP of +1.28% and is a #3 Ranked player. The company’s second-quarter 2018 results are slated to be announced on Jul 31. American Axle & Manufacturing Holdings, Inc. AXL has an Earnings ESP of +0.89% and a Zacks Rank of 3. The company will report second-quarter 2018 results on Aug 3.